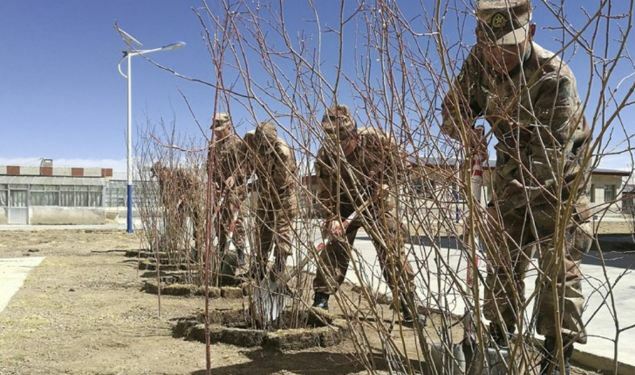 (TibetanReview.net, Nov20, 2017) – With an aim to make the landscape more welcoming for Han settlers and soldiers struggling to cope emotionally with its treeless setting, China has launched a project to use solar power to melt permafrost in northern Tibet’s Nagchu region to allow trees to grow, reported the scmp.com Nov 18. The city has a near-polar climate but is known for its stark beauty and wildlife and as the former capital of the legendary Zhangzhung kingdom. However, it is described as the only “Chinese” city without a tree. But scientists are said to question the project’s value, worried about the cost and the environmental impact of the undertaking. However, the undertaking has captured the attention of Chinese President Xi Jinping, and hence the drive to make a success of it. “Some official might do this to flatter the president, but most scientists have concerns about this project,” the report quoted a researcher as saying, speaking on condition of anonymity. The report said workers had set up grassland solar panels in the area to convert sunlight to electricity for an enormous copper-wire grid buried in the ground. The generated heat melts the subsurface layer of frozen soil to save tree roots from “frostbite”, scientists who have visited the experimental site have been cited as saying. A report on the website of the Science and Technology Department of the Tibet Autonomous Region has been cited as saying that in recent months, a forest had begun to emerge, encompassing an area equivalent to more than 30 sports stadiums, and consisting of fir, cypress and pine trees. Referring to the project’s expected cost of tens of millions of yuan, another scientist has questioned its sustainability. The report also cited a scientist who had observed the area for years as saying the project would upset the Tibetan Plateau’s ecological balance. The sudden emergence of an artificial forest and solar power plants would drain the area’s water resources, ruin the natural habitat and disrupt the fragile food chain, the scientist has said. Nevertheless, if the strategy, which has never before been applied to create an artificial forest, proved effective this winter, trees might start appearing in Nagchu city in the years to come, one scientist was cited as saying. The report cited President Xi Jinping, who had visited Nagchu while deputy party secretary of Fujian province in the late 1990s, as saying he vividly remembered the city as set on a plateau of permafrost in a harsh environment similar to that of the polar regions. “To people who could plant a tree and make it live, the reward [by the local government] started from the earliest amount of several thousand yuan, to 100,000 yuan (US$15,100) in the year I went,” the president was reported to have been quoted by People’s Daily as saying in a meeting with more than 200 county-level Communist Party secretaries in 2015. And last month, Xi was reported to have been briefed by the Ministry of Science and Technology on the new forestation project. Afterward, he said he would “continue to pay attention to Nagchu’s tree plantation programme”, the Tibetan Science and Technology Department article was reported to have quoted Xi as saying. Chinese settlers in the area were reported to look forward to the project becoming a success. The report cited the owner of a Sichuan restaurant near the Nagchu government offices as saying he hoped the tree experiment in the city succeeded, because the sight of green-needled, long-limbed additions could ease his homesickness. The report also cited a People’s Liberation Army Daily report as saying that Soldiers from Nagchu who would go to Lhasa on leave were known to leap off their buses to hug a tree, in tears. This was stated to be because Nagchu had no trees, lacked oxygen, was extremely cold and geographically isolated. In 2010, native Tibetans, mostly herdsmen and women, accounted for more than 96 per cent of Nagchu’s population of 460,000, the report cited official statistics as showing. But now, nearly half the population comprised Han Chinese from inland China, the restaurant owner was cited as saying.